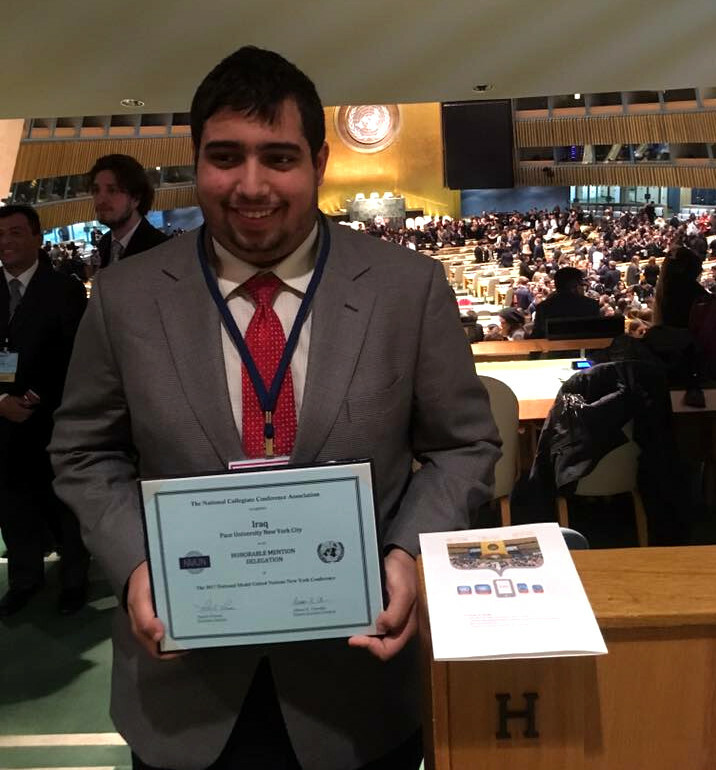 David Sharif ’19 showing off the award he and other Pace University New York City students received for representing Iraq at the 2017 National Model United Nations conference in New York. I am a Political Science major and Peace and Justice Studies minor at Pace University. This semester I got to participate at the 2017 National Model United Nations Conference in New York City, as a student delegate with the Pace New York City Model UN program. I chose to represent Iraq in a simulation of the High-Level Political Forum on Sustainable Development. Writing my position paper prior to the conference required a lot of editing and preparation, but it motivated me to further develop my research, understand how my committee worked and the organization of the United Nations. During the conference, I felt very lucky for the opportunity to work with delegates from all over the world. After giving my very first speech on the second day of the conference, I worked on a draft resolution with delegates representing Somalia, Pakistan, Syria, Samoa, Oman, Italy and many more, who were on the same page of what I wanted to accomplish through youth leadership and education. My participation at the conference motivated me to apply my skills through public speaking, interactions with others, and writing papers in different formats. These skills will be important for my future. At the closing ceremony, I was excited to learn that those of us who represented Iraq earned an Honorable Mention. Model UN is a life-changing experience with travel opportunities in the USA and other parts of the world. The course itself really pushes students who have interests in government, the United Nations, policymaking, or being a lawyer. Taking my first workshop and three-hundred level political science course as a sophomore has really improved my studies more than almost any other political science course I have taken. People have told me it is a very difficult course, but it did not stop me from standing up to the challenge. This entry was posted in Student Delegate Blogs and tagged David Sharif, Model UN, MUN, National Model UN, NMUN, Pace University. Bookmark the permalink.